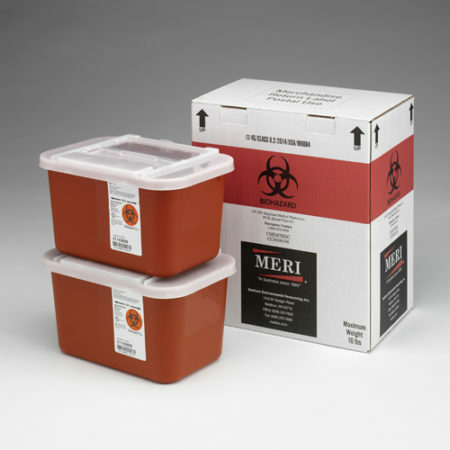 Remove your needles and infectious waste with MERI Inc.’s 1 Gallon Sharps Disposal Mailback Containers (Qty 2). DOT and USPS certified, together they hold up to eight pounds of waste. Best of all, this system features everything for one purchase price. And, it documents the cradle-to-grave destruction of your biohazard materials. When ordering, please allow one to two business days for delivery. Before sending your full biohazard containers back to MERI Inc., be sure to sign the manifest located on the side of the shipping box. And, please note that return shipping must be done through the United States Postal Service. If needed, order another MERI mailback kit before returning yours so that you can always have a safe place to store your biohazard materials. 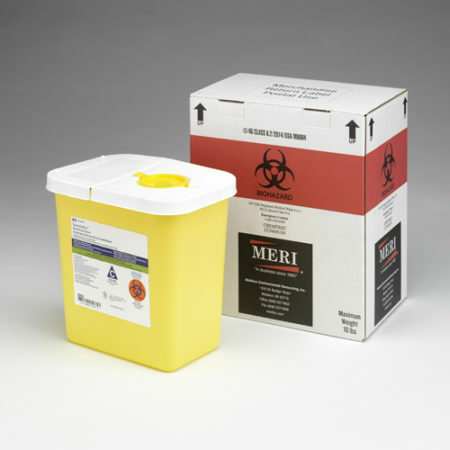 Remove your needles and infectious waste with MERI Inc.’s 1 Gallon Sharps Disposal Mailback Containers (Qty 2). Features everything for one purchase price. A manifest noting proper destruction of your infectious waste. MERI’s mailback kits are a cost-effective way for schools, homes and offices to dispose of epi pens after use. Moreover, they are an easy way to remove needles and lancets from diabetic injections. Or, as a way to store injections from arthritis medicines or other injectable medications. Infusion companies and pharmacies give them to patients who require injectable at-home medications. 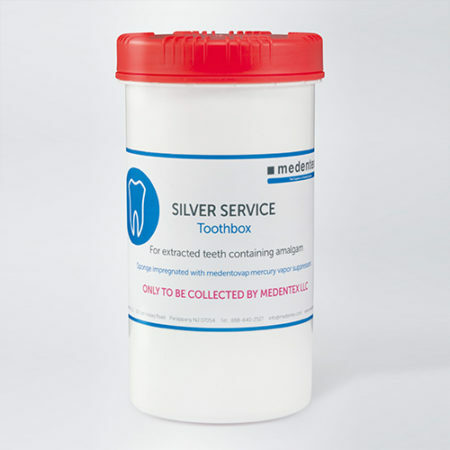 Also, medical clinics, nursing homes, dental and veterinarian offices use MERI Inc.’s compliant mailback containers in lieu of a medical waste collection service. In addition, acupuncturists and tattoo artists use them to document proper needle destruction. And, biotech and research facilities find them a great solution for documenting the removing of their biohazard waste. Furthermore, police and crime scene responders get rid of infectious materials with these handy mailback kits. Lastly, safety managers at manufacturing and athletic facilities use MERI Inc.’s mailback kits to collect and destroy material containing blood borne pathogens. 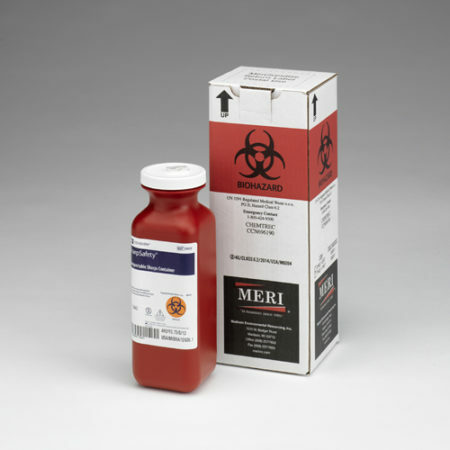 What can go inside a MERI Inc.’s Sharps Disposal Mailback Container? 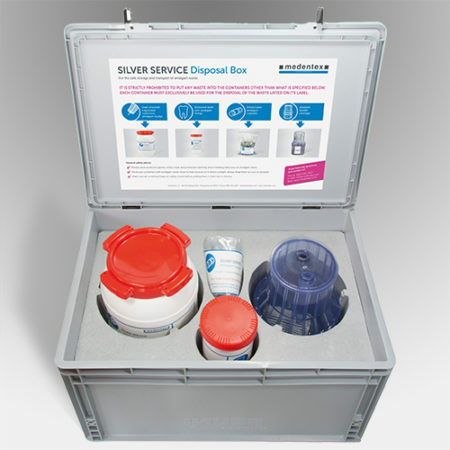 Each rigid, USPS and DOT certified biohazard container holds about four pounds of biohazard waste. This includes sharps, needles, lancets (fingerstick devices), syringes and auto injectors. Likewise, scalpel blades, pipettes, and discarded glass or rigid vials containing infectious agents can go inside of it. Up to four pounds of sharps, needles, lancets (fingerstick devices), syringes, auto injectors, scalpel blades, pipettes, and discarded glass or rigid vials containing infectious agents. Also, items with blood-borne pathogens, used specimen swabs, urine dipsticks or used specimen cups, gloves, or anything contaminated with feces.